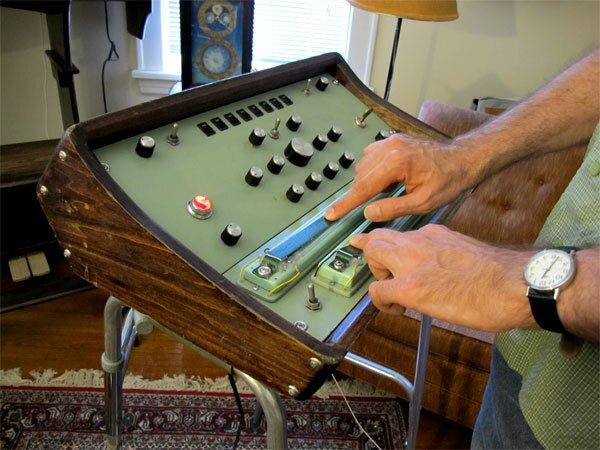 The bottom section of the panel provides controls such as filters and ADSR envelope generators that can further modify the sound. The Wall Gins are a series of hanging instruments that warble and bloop at irregular intervals. They can stand alone or they can be sync’ed up with other Wall Gins using a rotary ordinator, such as in the Dewan’s exhibition “Irregular Hours” at Pierogi. 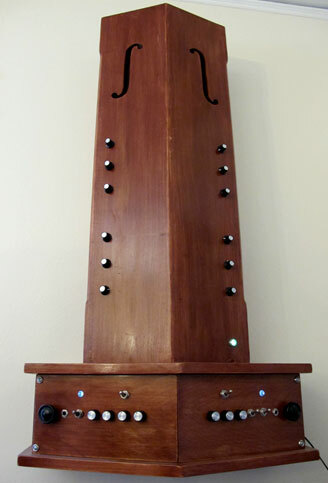 Brian cited clocks as an inspiration, except the Wall Gins series turns the notion of timekeeping on its head, where the units operate on their “own temporal agenda.” The Wall Gins’ electronic arbitration system contains an algorithm that controls the chaotic emission of sound. Of all the Wall Gins created, only one is programmed to keep time, The Vigilometer, which Brian and Leon described as a vigilante clock in a world of lawless non-clocks. I saw two examples of the Wall Gins - The Fiddler (above) and The Irregulator. The Fiddler’s infrequent chirping reminded us of its presence throughout my visit. The Dewan’s Swarmatron generated a bit of attention recently in a cameo for the promo of Trent Reznor’s new band How To Destroy Angels. Apparently, Reznor discovered Dewanatron via the music shop Big City Music in Los Angeles, who have been big supporters of Dewanatron and carry a number of their instruments. Two bands - or pitch ribbons - line the bottom of the body of the Swarmatron. 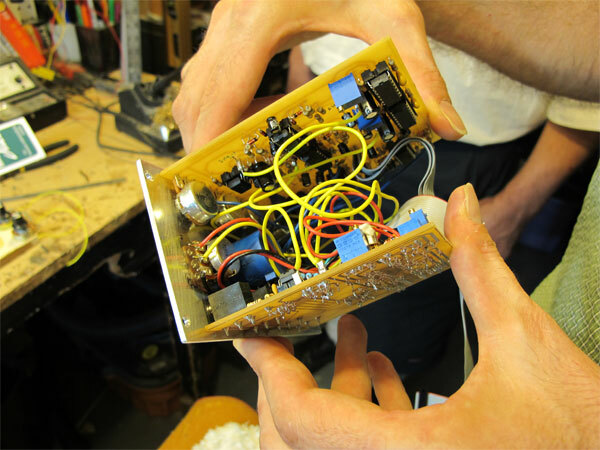 These bands act as an interface for the music. 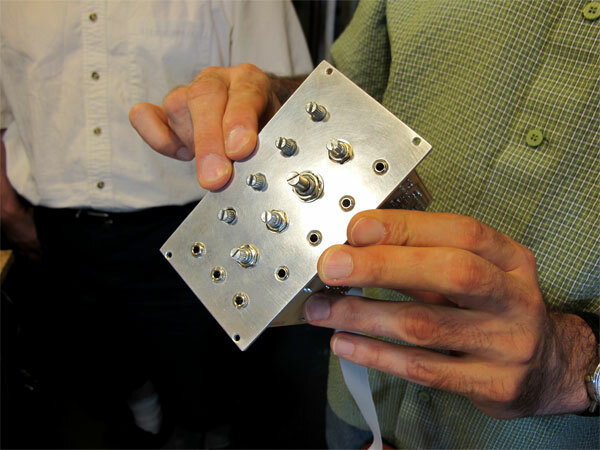 The Swarmatron has eight separate voices that can either sound in unison or be spread out into clusters and chords. The top band controls the central pitch of the notes, and the bottom band controls the separation of the voices. 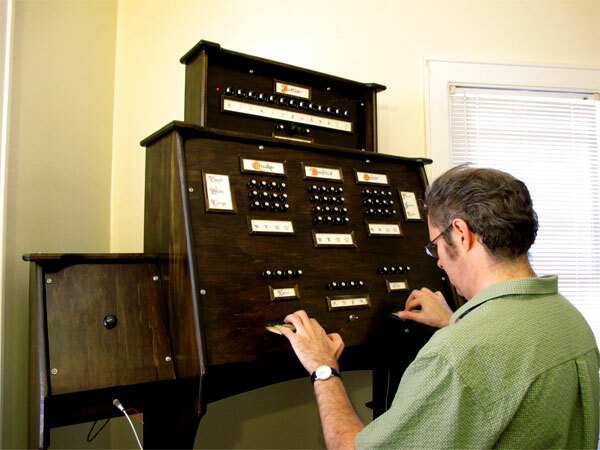 Eight black switches line the top, and are used to turn individual voices off or on. The Swarmatron produces an eerie, ambient choral sound, which ranges from peaceful lulls reminiscent of Brian Eno to the sinister sweeps of Angelo Badalamenti, the composer behind many of David Lynch’s soundtracks. Brian called the Melody Gin the “deluxe version” of the Wall Gins in terms of its architecture, however, unlike the Wall Gins, it is built to be manually played like a traditional instrument. 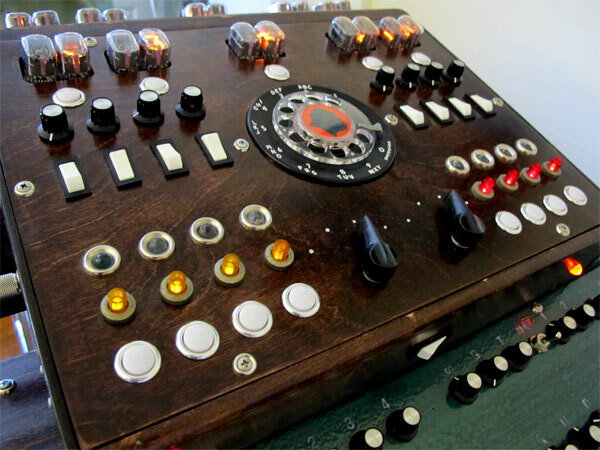 Four columns of knobs on the left hand side of the Melody Gin control the oscillators, which produce the note. 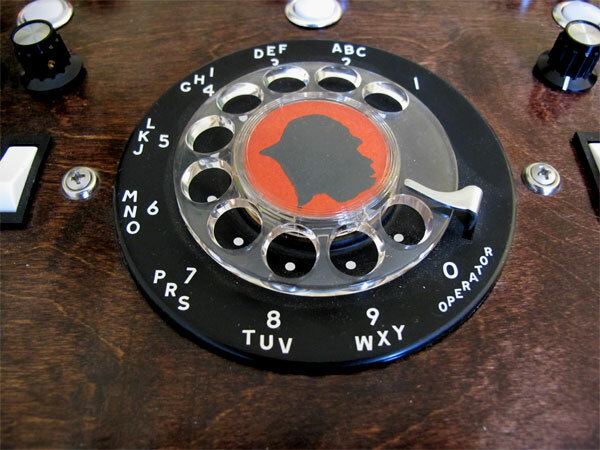 The keys at the bottom are subtractive, meaning that they pull out elements of the oscillators. The unit has additional controls for glide, slice, and timbre on the right hand side. 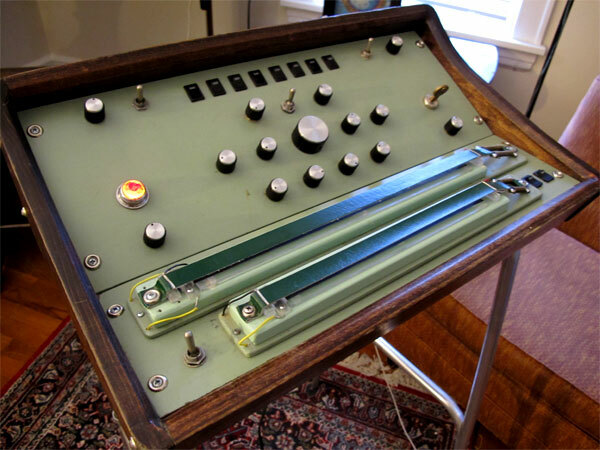 A permanent fixture in Leon’s living room, the Hymnotron is a behemoth that rarely travels. One of its few adventures was a trip to P.S.1 in the summer of 2007 for their outdoor concert series Warm-Up. 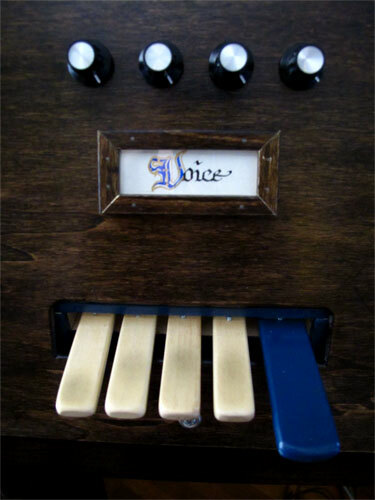 The instrument is a four voice just intonation chord organ: when a chord is played, the fractional relationships between the notes of the chord are maintained as the root is moved around so that the chord is always precisely in tune with itself. 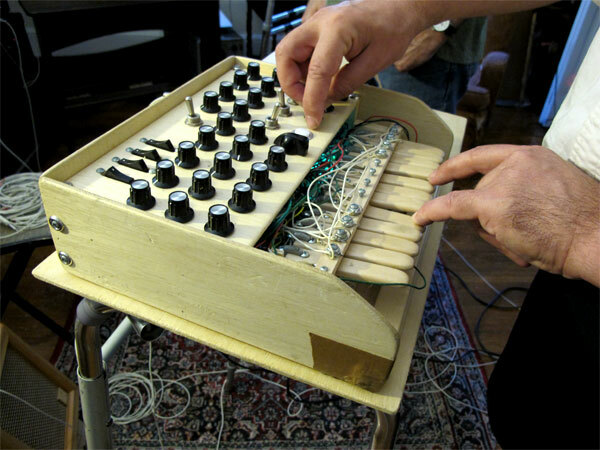 The foot pedals control the type of chord and bass voicings. Chord root notes can be selected by the left hand keys (labeled "Voice"). Pressing the different combinations of these four keys yields 16 root notes. 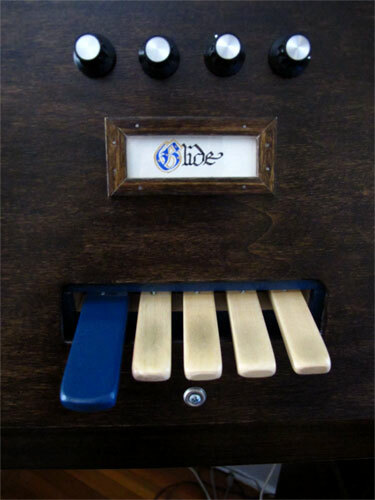 Each of the right hand keys (labeled "Glide") raises a particular note in the chord by an octave, so that different inversions can be played. As you can see, all of the labels were beautifully calligraphied by Leon’s late mother, Dorothy Dewan, who worked as a professional calligrapher. 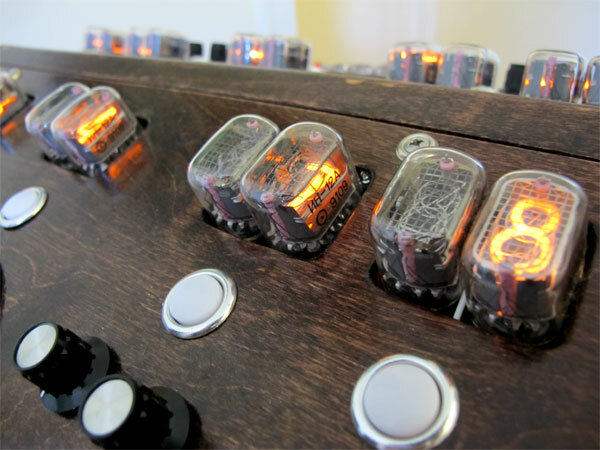 Above the keys are rows of knobs- labeled Quake, Nimbus, and Orbit. 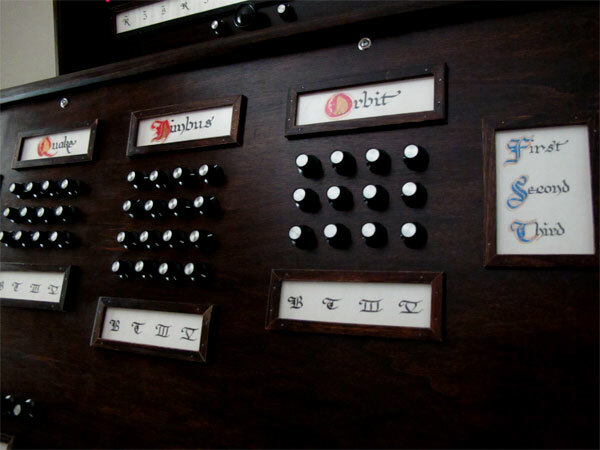 The Nimbus and orbit knobs adjust the various cascading overtone settings for each voice. The Quake controls adjust the rate at which each voice can be interrupted to varying degrees. 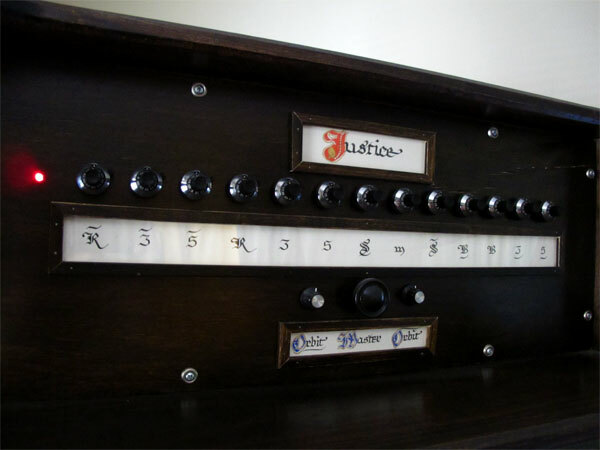 “Justice” - which aptly sits at the top - controls the fundamental tuning of the organ. Leon termed this the “Just Intonation Headquarters." 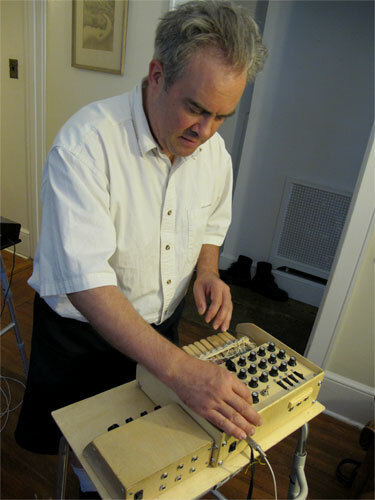 Leon played a short churchy riff to demonstrate the Hymnotron’s hymn-making properties and then allowed the instrument to drone in a warm, cascading sound for awhile. 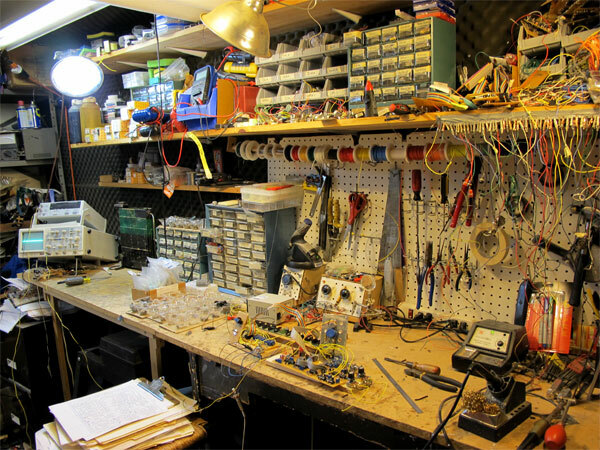 After a whirlwind tour of all of the Dewan instruments, I got to go downstairs to Leon’s workshop. As you can see, it definitely has that mad scientist feel. 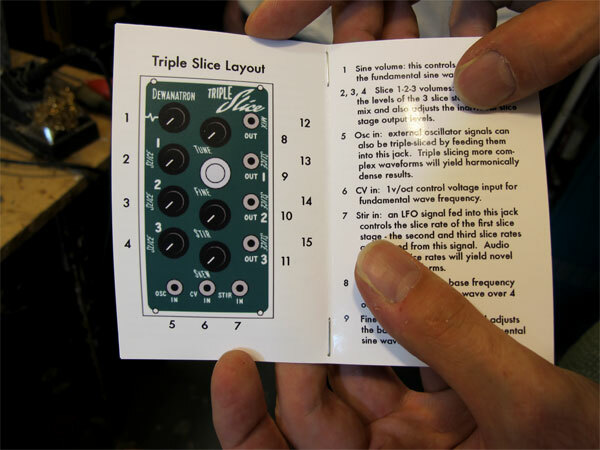 The Dewans are currently building 30 synth modules - called the Triple Slice - for Big City Music. 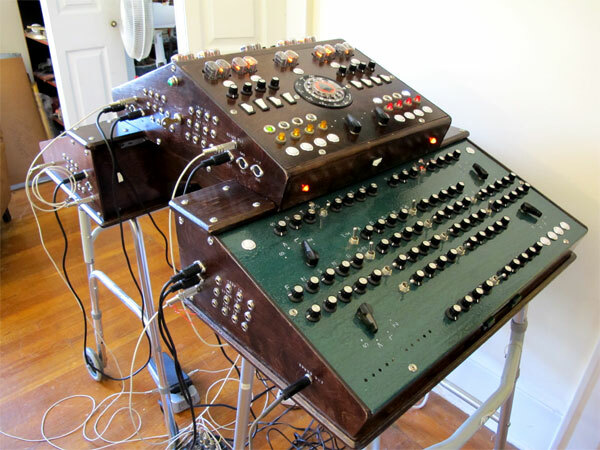 These modules are designed to be used as part of existing modular synthesizer setups. 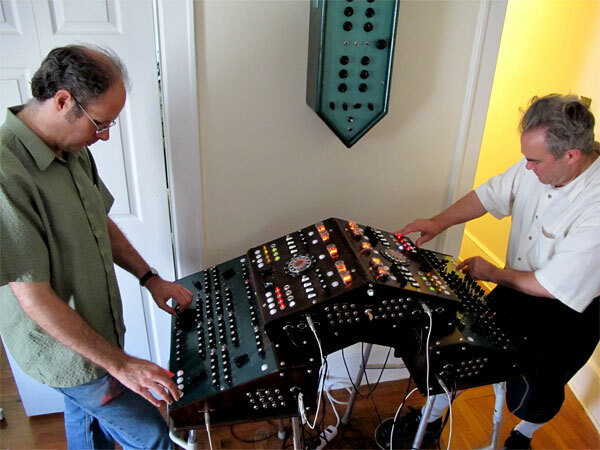 The modules are much less expensive than their stand-alone instruments - Leon described them as a “bit-sized piece of Dewanatron." Leon plugged in the Triple Slice for me to hear - and see on the oscilloscope! It sounded great. Thanks again to Dewanatron for letting me visit their studio. If you live in Brooklyn or the NY area and would like to see their work first hand, one of their Wall Gins, The Lamp Lighter, is currently on display in the group exhibition "Instructions Not Included" at Pierogi Gallery.